Deciding how much seed to purchase can be tricky when planning your vegetable garden. First you must know what your intentions are with your garden. Will your garden provide a little extra fresh produce during the spring and summer season? 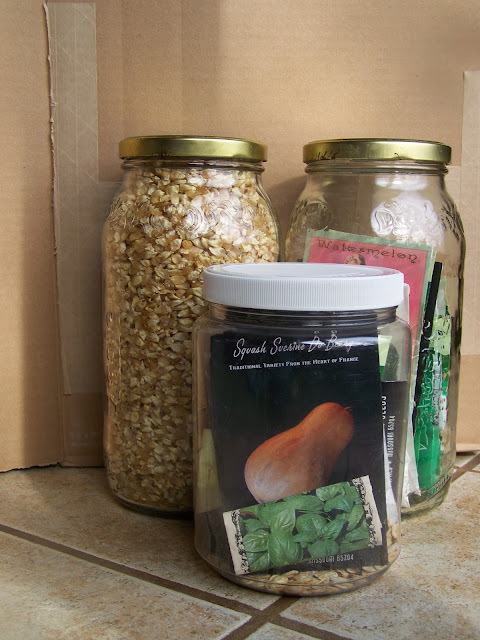 Or do you hope to preserve enough food to feed your family until the next year's garden is producing? Or perhaps you hope to do something in between the two extremes. I find that I can easily get carried away when planning my garden. The garden catalog(s) are so beautiful and the varieties are intoxicating! It is fun to try new veggies but it's not cool to discover that you must go to the grocery store to purchase the good ol' favorites because you didn't plant enough to get you through the season. It has worked well for us to follow an 80/20 ratio when purchasing seeds and planting our garden. Approximately 80% of what we grow are our favorite, time-tested standbyes. 20% are new to our garden, either vegetables or herbs we've not grown before, or a new variety of a vegetable we've grown in the past. How Much Seed to Purchase? 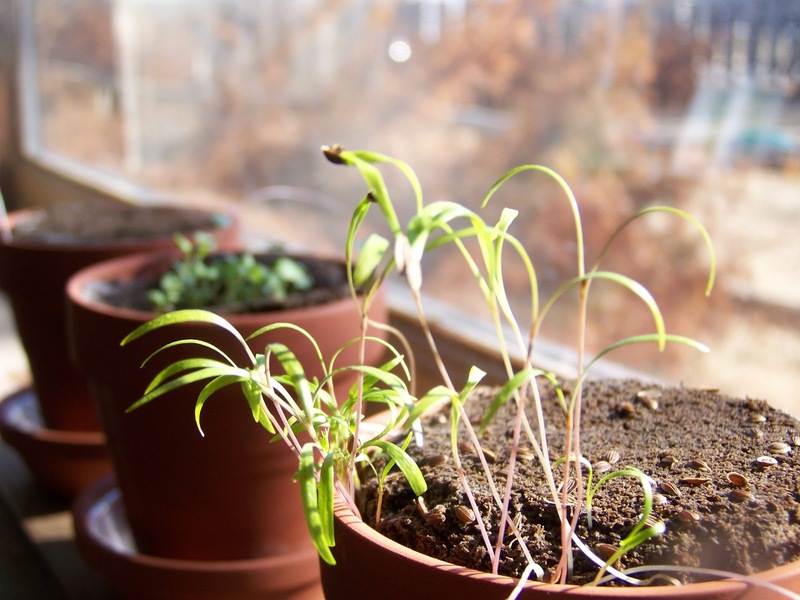 There are multiple on-line sources to help you decide how much seed to plant. But I've yet to find a site that will tell you exactly how much to plant per person. I thought I would take some time to give you guidelines but after putting much thought to it, I've realized I can't tell you either! I can tell you what we plant approximately. Hopefully this will give you an idea of how much you should plant. We have eight members in our family. Our family consists of - two adults, two teenage boys that eat as much or more than an adult, two preteen daughters that eat as much as I do at times, a seven year old little boy that exists on air and water alone, and a two year little girl who loves veggies. Plus we feed lunch to 7 or 9 daycare children 5 days a week. Our garden goal is to produce all of our family's produce for each year. Of course the zone we live in causes us to purchase some things like bananas, oranges and avocado. And we've not gotten our greenhouse finished so if we want a fresh salad in the off season, we must purchase that produce. Tomatoes - 50 to 60 plants (a mixture of paste tomatoes and large beefy style) - We eat fresh, can, dehydrate and sometimes freeze. Dried Beans - 4 lbs worth of different varieties - Dry for soups, etc. Carrots - Seeds are so small, and we've been saving our carrot seeds for many years now. So I'm afraid I can't tell you anything other than we put approximately 3 to 5 seeds every square inch and plant an entire 4 ft by 8 ft plot. We also plant some carrots arround the tomatoes as they make good companion plants. We usually plant about 2 cups of saved seeds. I'm really not sure how many seed packets that would be. We eat carrots through the summer and put the rest up by freezing, dehydrating and pickling. Garlic - We've grown garlic just for fun in the past. We'll plant about 50 cloves this year and see how far that takes us. There will be other odds and ends of things we will plant but these are the mainstays of our garden. I hope you find this hopeful! I am working hard on determining exactly how many of each vegetable to plant as well. Last year I planted 142 tomato plants a mixture of large and paste types. I canned a lot different ways! We ate a lot fresh. This year I have planted 150 tomato seeds for seedlings, some I know won't come up but over all I have a very good germination rate with tomatoes so I figure 135-140 anyway. Squash is another thing we eat a lot of and I can them in canning items, relishes, pickles etc. I am going to freeze (new) and dehydrate (new)some this year. I don't normally freeze stuff due to electricity can go out and you can loose your freezer of food. But we have a generator now. Out here where we live loosing power happens uggg way to often. But I am determined to not buy any from the store again given so many are being grown from GMO seeds now, about 80% of yellow squash and not sure on the zucchini but its a lot. We try hard to avoid veggies from GMO seeds, so bad for our health. :O(. I think with freezing and dehydrating I can cover us from one growing season to another. I have really been happy with everything I have dehydrated thus far so I am expanding my dehydrating. My cucumbers have not done well the last several years, I am hoping for a different outcome this year! If not then my squash will also be used again for pickles, if you ever have a bad cucumber year your Zucchini and yellow squash can replace them! I read this in a article a while back and yep they so work! Zucchini is great for your dill relish and sweet relish it even looks just like cucumbers and taste the same in the relish! The yellow squash make excellent bread and butter pickles. This year if my cucs dont make again sighhhh I am going to use Zucchini to do some dill pickle spears as well! I also agree its very hard to stay on track when you get the seed catalogs and they have so many tempting pictures :O).. this year I did better than I ever have sticking to my list and what I knew for sure we would eat and use! Pumpkins are a new one for me this year. The cost of canned organic pumpkin and heck even non organic is getting silly isn't it. We use quite a bit of canned pumpkin in muffins, pies, soup etc. So I am trying some sugar pie pumpkins this year, hoping to grow enough to can 24 jars. Its hard to know how many to plant to get that many pumpkins. But I figure I can feed any extra to the goats! They like pumpkin :O). Peppers I am torn over, I am planting my seedling seeds next 25 and 26 as the framers almanac says those are great days to plant your pepper seedlings, I am so torn over how many of each variety to plant! We eat a lot of peppers and I dehydrate quite a few for cooking with each year. This year I want to freeze some. I also make Jalapeno jelly every year a couple cases. Then I pickle some... Tough call on how many to do :O)...Again I want to not buy any peppers from the store in between growing seasons, peppers are on what they call the dirty dozen list, 12 highest pesticides and herbicide veggies you can buy, unless they are organic. So I am probably going to plant high and adjust from there. My ultimate goal is to grow as much of our food as I possibly can and stop buying it! Wow, you have seriously got it going on! Yes, I agree, squash makes wonderful pickles and relish. In fact, my husband thinks the best relish he has ever eaten is some zucchini relish that I made one year when we had so much squash we didn't know what to do with it! I even made "apple pie" with zucchini. My kids started asking me before they tried a new dish if it was zucchini :0) Too funny! I agree about not buying peppers. And I think you can't go wrong over planting peppers. I have some Serano peppers that I dehydrated two summers ago and we are still using them. No flavor lost! Can't wait to see how this garden season goes! Thanks for the great and helpful comments! Oh my! You must plant a HUGE garden. Last year I cut down to 30 tomato plants for our family of 5 It probably would have been fine if it had been a normal year weather wise but it turned out to be a bummer of a garden year for me- all the way around. I'm hoping 2012 is a better garden! I, too like trying some new things in the garden every year. But this year, even with new things, I'm going to try more plants of less varieties. We'll see how long I can stick with that!! Oh Judy, we struggled with our garden last year as well! In fact everyone around here didn't have much luck. I feel really optimistic about this year. Of course, having the winter break from the garden always makes me look forward to next summer! Thats's a great list! We need to plant way more tomato plants! Can't wait for the day when we have enough space for 50plants instead of our usual 15. Thanks for stopping by! I'm guessing 15 tomato plants probably seem like a lot to some people. But 50 is adequate to take care of just about any tomato need or want you might have! Can't wait to see your garden grow! Have a great weekend! Haven't gone through most of your site yet. What method are you experimenting with on potatoes? Do you chit them prior to tossing them in? Hilling or do you plant them about 9 inches down in double dug soil letting them grow up? This is the method I am going to try out. Kitsap was getting some impressive yields with it. No, I haven't purposely chitted (sp?) my potatoes prior to planting although you could if you have doubts about the grocery store ones being treated with a retardent . I just cut the potatoes into pieces being certain to leave one or two eyes on each piece. I let them cure 3 to 5 days, then plant them about 5 or 6 inches down. Perhaps I should try a different method though because I feel like each plant doesn't produce as much as it should. I'll have to pay attention to how yours do. I've heard of people getting great results by digging a trench about 12 inches deep then layering straw and compost about 6 inches worth, seedling potatoes, then covering with more straw and compost. I guess you pile on more mulching materials as it compacts down. Supposed to be easy at harvest time as well. I never tried this method as I never seemed to have enough straw or compost lying around. The best potatoes I ever grew were quite by accident from potato peels in my compost pile! Crazy! The layering trench sounds close enough to the double-dig method. Laura (Kitsap) at modernvictorygarden.com is using it. I've been encourage by the yields she is seeing. But really, they were fantastic! Not stinky or anything. I discovered them because I could see the plant growing, and not thinking about it being anything other than a weed, I gave it a tug. Lo and behold, I had potatoes!!!! What does this say about me that I served them with dinner that night? Crazy - or brave? I'll go with brave!!! I grew some potatoes in my old compost pile last year as well although they were small. That's so funny! Were the potatoes from peelings as well?